We are embarking on the first major renovation to the locker room since it was built in 1972. 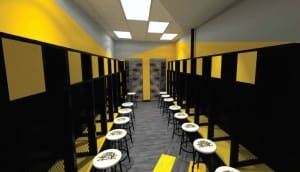 Please help us reach our goal of raising at least $10,000 to reconstruct and transform our locker room into a space that we can be proud of and use to take our team to the next level. Any help from our alumni, current students, parents and the Northern Kentucky community will mean a lot to the program and the school. Make an impact today! With NKU transitioning to Division I, we need to set ourselves apart from other schools. The new facility will help bring future prospects for the Norse, which will have a positive impact on the entire campus. The community will benefit from this project as the NKU women’s volleyball team climbs to the top of the Horizon League and make a statement in Division I athletics. The women’s volleyball team will directly benefit from this project along with our coaching staff and future student-athletes. Program participants will spend a significant amount of time in the locker room throughout the year. 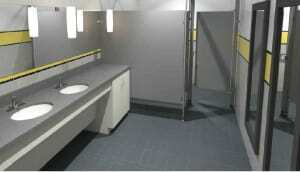 The renovation will provide the team with more of their own space and a separate bathroom and shower. 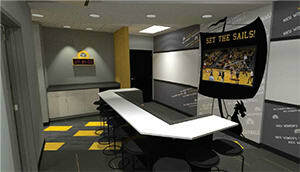 Coaching staff will have a separate space for showing film to their current student-athletes. And this same space will be a great area for our athletes to lounge and study in between class times. Any size gift is greatly appreciated, but every donation of $500 or more will be recognized with the donor's name engraved on a plaque to be hung inside the locker room suite. The donor will also get a sneak peek opportunity to preview the space on a future date. This recognition will allow current and future players to see who had a part in making this renovation a reality. See the chart below to learn more about the benefits you will receive by donating to this project. 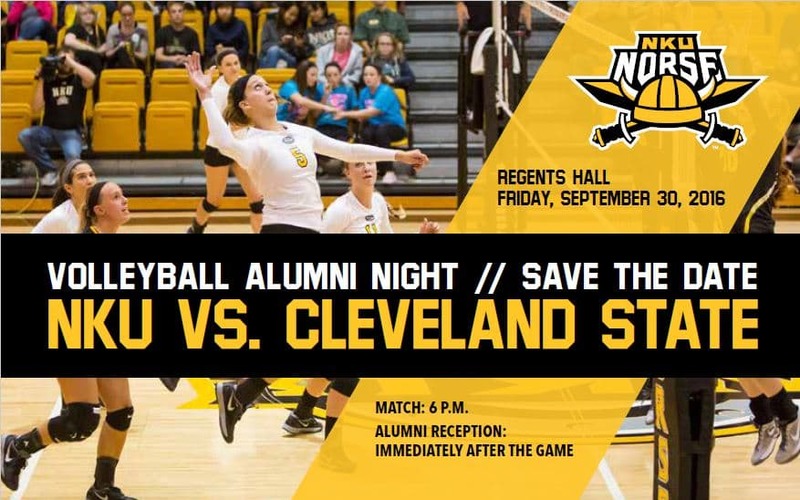 Join us Friday, September 30, for Alumni Night as the NKU volleyball team takes on Oakland University at 6:00 pm in Regents Hall for its first home match of the season. A small reception will be held after the game in the back of the campus recreation center to celebrate the success of our past programs and to look ahead to the future of our program. Click here to RSVP. Dig our new locker room! Any gift up to $100 will receive a Car Emblem, Quarterly Norse newsletter, and a Fall Sports Pass. Expanding on the tradition block by block. Any gift up to $100 will receive a Car Emblem, Quarterly Norse newsletter, and a Fall Sports Pass. Serve up your support for this project! 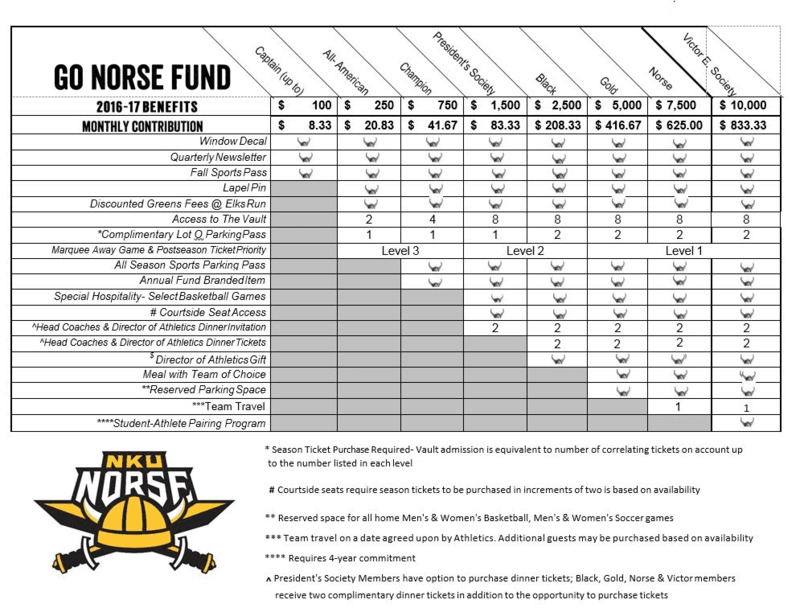 Any gift of $100 will receive a Car Emblem, Quarterly Norse newsletter, and a Fall Sports Pass. Assist our program by making our locker room renovation possible. Any gift at the $250 level will include a Lapel Pin, Discounted Greens Fees @ Elks Run, and Access to the Vault for basketball games in addition to all benefits at the Serve Level. Spike your way into recognition! Donors at this level will be recognized on a plaque inside the new locker room. Assist our program by making our locker room renovation possible. Any gift at the $500 level will also receive an All Season Sports Parking Pass and an Annual Fund Branded Item in addition to all benefits at the Assist Level. Here's your one shot to be an ace for the program! Donors at this level will be recognized on a plaque inside the new locker room. Any gift at the $1,000 level will also be recognized as President's Society members and will also receive an invitation for two to the Head Coaches & Director of Athletics Dinner in addition to all benefits at the Spike Level.